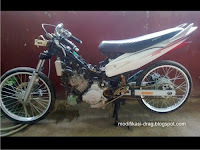 YAMAHA JUPITER MX DRAG MODIFICATION product long motor YAMAHA. but JUPITER MX still very often used in arena drag race to fight speed. with merger science "KOREKAN" long and new to merged to modify JUPITER MX be powerfuler.